Join Us for an evening of good vibrations with Sound and Movement! Everything in the universe vibrates ~ from the smallest particles, to our cells, to the planets in our Solar system. 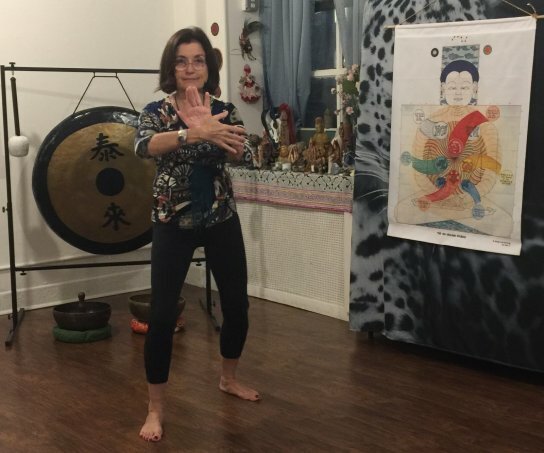 Throughout the evening event LinDel will guide us through simple Qigong movements with the Six Healing Sounds for transforming our heavy emotions into positive attributes. The Six Healing Sounds are a self-healing meditation developed by Chinese Taoist shamans and sages thousands of years ago. The movements are simple and easy to learn while, Judith Grasshopper will weave in the sounds of her gongs and Tibetan singing bowls - definitely bringing in good vibrations. By combining physical movements with sounds, you help bring those good vibrations more deeply within. As we peak towards the evening, relax in meditative stillness as we soak in the healing vibrations of beautiful rich gong energy vibrations. Please arrive by at 6:45 pm - 7:00 afterwards lobby doors will be closed. LinDel Sandlin has been avidly practicing tai chi and qi gong meditation for almost 30 years. In 2012, she became a certified instructor in the Universal Healing Tao system created by Grandmaster Mantak Chia. She currently teaches classes in both Qigong (meditation) and Tai Chi on Manhattan's Upper West Side. LinDel also spent several years training in shamanic energy healing in various South and Central American indigenous traditions. She is a graduate of The Light Body School of the Four Winds Society and apprenticed with Irma StarSpirit Woman in her MedicineWay shamanic healing program. LinDel also holds a certification for MedicineWay Crystal Healing - Levels I & II - and in the Alexander Vibrational Sound Therapy system. To find out about her classes or if shamanic energy healing may be right for you, please contact her at LinDel.SmilingChi@gmail.com.